We believe that a photobook is great for any occasion, which is why we offer a range of different sizes and styles to suit everyone’s tastes and budgets, from cheap photo books for fun projects to more luxurious styles for special occasions. Our lay flat photo books make beautiful coffee table style books to display photographs of special occasions such as weddings (also see dedicated wedding photobooks). 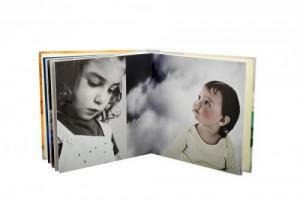 However, we also offer photobooks for more everyday events, with a great value price to match. Photobooks make wonderful gifts for friends after a memorable holiday, or day out. When you’re buying several at once, cost will be an issue which is why The Photobookstore also has a range of fabulous cheap photobooks that offer the same great quality binding, but come in smaller sizes and are cheap enough to buy in bulk! And all our photo books can be created using our own easy-to-use FREE photobook software that makes producing and designing your cheap photo book a doddle! What’s more, in September we’re offering a whopping 25% discount on photobooks on your first order.